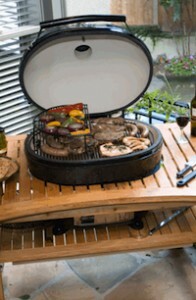 Primo Grills And Smokers Are The ONLY American Made Ceramic Grills! Primo is the only ceramic grill manufactured in the USA. Each cooker is Hand-made and carefully inspected for quality before it leaves the factory, so you can feel secure about your investment. With the patented Primo Oval-shaped grill you get the finest, most efficient ceramic composition and largest cooking surface on the market today! Primo offers numerous convenient accessories including rack extentions, firebox divider, drip pan rack, baking stone, ash tool, grill lifter, rib rack, lump charcoal, Quick Lights (fire starters), ceramic reflector plates, metal cradle stand, and wood tables.